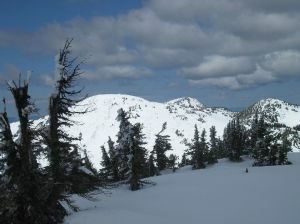 This peak is #96 in Prominence List for British Columbia .Mount Tod is the highest of three peaks which make up the "Sun Peaks" ski resort near Kamloops. Name Notes: The name commemorates John Tod, the most prominent early Hudson's Bay Company fur trading factor in what was then New Caledonia. He "bossed" Fort MacLeod from 1823 to 1832, and spent time in Kamloops, overseeing the construction of a new fort there in 1946. He eventually retired to Victoria, where in 1850 he began construction on his home, which now is the oldest inhabited house in British Columbia. He lived to be 92, dying in Victoria in 1882. The ski resort used to be known as Tod Mountain, but was changed by new owners to "Sun Peaks", to reflect that the ski resort is one of the sunniest in the province. The fact that the name of the resort was changed from "Tod" because it means "Death" in German is a bit of a myth. The resort still promote the historical name of the mountain.